With silver bells, and cockle shells, and pretty maids all in a row. Pink and blue shimmering vintage bits in glass and pearl are joined with a large white bead decorated with pretty flowers on this handmade beaded bookmark. All set to hang together on a gold-plated shepherd's book hook. 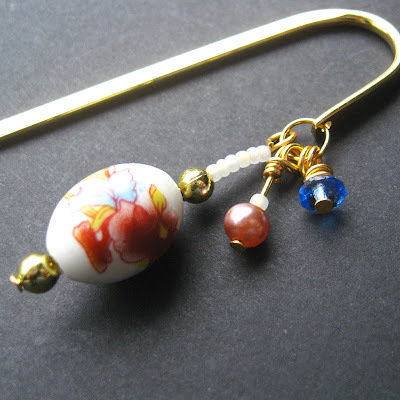 Perfect for books, journals and more, our beaded bookmarks come in a variety of styles that are sure to mark your place with your own personal style without damaging book's pages by the commonly used corner-folding methods. In this bookmark, the shepherd's hook is 5-inches (12.7 cm) long with three beaded tassels attached to dangle along the spine of the book it's used in.